You may contact David directly to place an order. This may be especially helpful if you still have unanswered questions about his vases or if you are considering ordering a custom decorated vase. If you are ready to order your Wedding Wish Vase and it is a standard or premium decoration option you can use David's Wedding Wish Vase Etsy site to place your order. It is a simple process and payment is handled through PayPal. Standard vases available through David's Etsy site. Use coupon code SHIPFREE to receive free shipping for limited time! 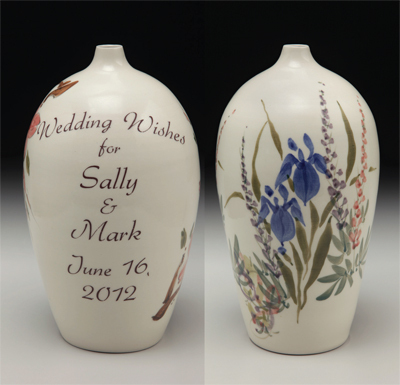 Wedding Wish Vases are also available through a national online catalogue, Hatch, link here. Visit David's studio to see samples in person and discuss options, by appointment.